With a plethora of independent players getting the call from MLB clubs, it’s always a fun to take a step back and check up on their progress. 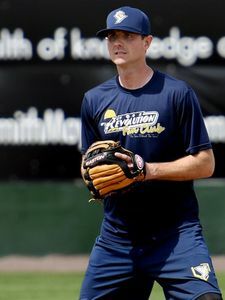 Josh Wilson, a veteran infielder with eight years of MLB experience and 19 total years under his belt, became the first York Revolution player to sign a minor league contract this year. After signing with the Revs to return for a second season, the Texas Rangers scooped up the sure handed infielder and assigned him to Triple-A Round Rock where he proceeded to hit .329 in 22 games. On June 1, his contract was purchased by the Cleveland Indians and immediately assigned to Triple-A Columbus. In 32 games with the Clippers he’s batting .200 with two home runs and five RBI. Overall, Wilson’s batting .258 with 6 home runs and 21 RBI. Jarret Martin, another Revs players to sign with a MLB club, is cruising right along in Double-A Richmond (San Francisco Giants). Martin, who’s spent the majority of his eight-year career within the Los Angeles Dodgers organization, was putting up some of the best numbers of his career when the Giants signed him. In 18 games with York, he struck out 13.3 batters per nine innings while surrendering only two runs equating to a 0.98 ERA. Martin’s tenure in Richmond got off to a bumpy start, but over his last 10 games he’s 1-2 with a 2.19 ERA to go with 14 K’s in 12 innings. In 19 total appearances, batters are only hitting .167. Darian Sandford is a master of the stolen base, and it’s no surprise opportunity keeps knocking. WIth 430 stolen bases to his name, Sandford has made his mark on the independent game. In 2017 though, it was his bat that did the talking. After batting .340 for the Lanscaster Barnstormers, the Washington Nationals signed him to a minor league deal, marking the second time he’s inked an MLB deal after playing in the Indy leagues. While the numbers may be a little lower than expected, Sanford is toughing his way through one game at a time. Currently he’s hitting .232 with stolen 14 bases. You can say Blake Gailen is an Indy ball legend and you’d be spot on. On five separate occasions he’s leveraged his time in the Indy’s to a minor league contract. Year after year Gailen does what he has to do, and regardless of where he’s playing, scouts take notice. In 2012, he put up numbers so big, they rivaled anyone’s anywhere (338/.415/.534, with 26 doubles, three triples, 22 home runs, 89 RBI, and 25 stolen bases) earning team MVP as voted on by the fans, the Atlantic League MVP award, and Baseball America’s Independent Player of the Year. Since signing with the Tulsa Drillers (Double-A affiliate of the Dodgers), Gailen’s continued to pound the baseball. After 17 games he’s a tad under .285 (.283) with three big flies and 11 RBI. Not too shabby for someone undrafted out of university.